A grueling obstacle course – complete with a six-foot wall – isn’t much of a hurdle for Peel Regional Police Const. Jennifer Dagg. “Strength-wise, I’ve never had an issue,” said Dagg, who stands five-foot-four inches. 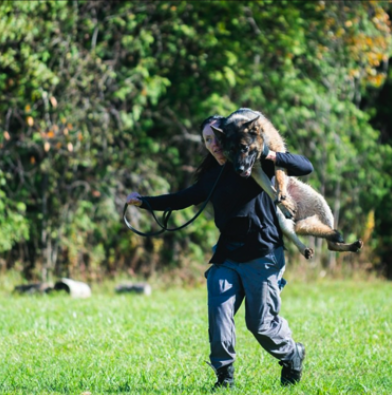 The former competitive bodybuilder is currently the only woman on the Peel K9 team — the third to ever make it, and the first to conquer the newer, tougher physical test. With 18 hurdles, the physical K9 evaluation – wearing a duty belt and vest, weighing a total of 30 to 40 pounds – starts with stairs and ends with a 2 km run. In between, there are six sets of six-foot wall climbs, half of which involve throwing a heavy bag. Three attempts is also what it took before Dagg made the K9 squad in 2013, but she said the interview process – not the physical component – is what tripped her up. Now, it’s her partner, Qaybre, an 80-pound Hungarian German Shepherd who tracks people and explosives. “He’s a good-looking dog,” she said. The pair won the women’s open category at the 2014 Iron Dog Challenge in Guelph, scoring the fastest time of 20:20 in a 3.25 km long course. While the K9 squad is the most physically demanding in policing, discipline and mental strength keep Dagg in check. “You can’t rely on just brawn because when you’re getting to a call, especially in K9, you have to be thinking on your feet at all times,” said Dagg. On top of that, “in this unit, you have to deal with failure” often, said Dagg. A lot of the time, “there is no answer,” Dagg said. How does she deal with the frustration? “I’m still trying to figure that out,” said Dagg. She worked out a technique to master the six-foot wall, although it took “an obscene amount of time” — 10 or 12 attempts, said Dagg, when she first tried scaling the wall years ago to see how she would fare. “I wasn’t quitting until I got over it,” said Dagg, a 15-year veteran who has spent her entire policing career with Peel. Dagg said she was so determined to master the wall, she came into the station on her own time and practiced. “It wasn’t something that I got right away,” said Dagg. Now it’s onto the next goal; Dagg lifts weights and runs. Last summer, she was logging 15 kms on a day off. “That’s my decompression,” said Dagg. So is spending time in the kitchen, making clean eats and treats. “I’m a really good baker,” said Dagg, adding her husband reaps the benefits.